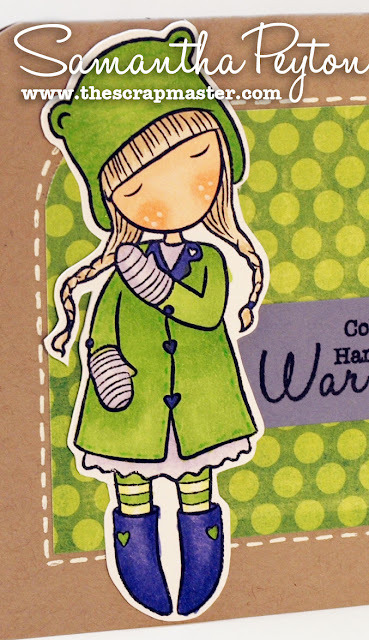 My project for today is a nice and wintery card. I just love it when winter comes. I love snuggling up in a blanket, hot cocoa, and mittens! Now even for winter themed cards, I like to use bold, bright colors. This card is no exception! This little girl image is from Gorjuss, called Bear Skin. I just loved her cute little bear hat and mittens. For her skin: E000, E00, and E01. I also added some little freckles with a white gel pen. For her outfit: YG23, YG25, YG0000, YG00, BV0000, BV00, and BV04. To her coat, I also added some glittery stitches using the #6 (Melon) At You Spica glitter pen. The sentiment is from SP and Company. Oh my gosh - I LOVE LOVE LOVE this Samantha! The greens and purples are divine!